As the nailing line separates good shingles from great ones, Owens Corning’s SureNail® Technology makes the world of difference. Built into the brand’s all Duration® Series products, expect your shingles to keep their grip onto your roof under the strongest of winds. Some roofers still nail shingles in the wrong areas, making them underperform and be blown off easier.The SureNail Technology creates a “No Guess” Nailing Zone to make fastening more effective. Lack of a visible nailing zone on the face of the shingle increases the risk of human error in roof installations. SureNail clearly defines the optimal fastening zone for your Detroit roofing company. This way, your roofer would know exactly where to nail, helping your shingles stay where they should be for the years to come. SureNail’s unique fabric strip forms a triple layer of reinforcement to deliver exceptional wind resistance. It creates a 200% wider common bond area, delivering two times better bond strength than standard shingles. This is the main reason Owens Corning’s Duration Series roofing products only need fewer nails than other architectural shingles to withstand 130 mph winds. Underneath every Duration Series shingle lies the SureNail Strip™. It enhances the already incredible gripping capability of Owens Corning’s Tru-Bond® sealant. As a result, your shingles have outstanding adhesive power to keep them laminated properly. In fact, a recent survey revealed that nine out of 10 roofing companies in Michigan and in the country believe shingles with SureNail deliver better wind-lift protection. 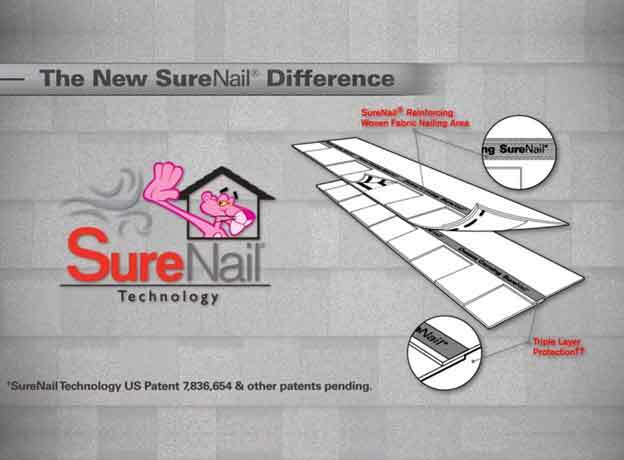 Make your new roof proof against blow-offs with the SureNail Technology. Call Kroll Construction now at (888) 338-6340 to schedule your free in-home inspection.